As Texas Medicaid Managed Care continues to evolve, it’s not surprising that long-term care providers continue to face new requirements. The latest change involves how you’ll submit Texas MCO Prior Authorization forms (and supporting documentation) for Medicaid reimbursement. This post will give you the scoop, plus explain how providers can simplify and automate Prior Authorization submissions to MCOs using SimpleCFS. The Texas Department of Insurance (TDI) has created a new standardized prior authorization form for use by all MCOs (plus other health benefit plan issuers). MCOs must start accepting the new Prior Authorization form beginning Tuesday, Sept. 1, 2015. The goal is create a uniform method for SNFs to send Texas MCO Prior Authorization forms and supporting documentation to the five Texas MCOs. Unfortunately it’s still a somewhat archaic fax process (rather than a direct data interchange), but at least it ensures that long-term care providers have just one form to manage rather a different one for each of the five MCOs. To simplify the process for customers, we’ve created a single place within SimpleCFS to manage all your Texas MCO Prior Authorization forms. You can already manage all your 3618/3619 forms, LTCMI and PASRR processes within SimpleCFS. And since Mar. 1, you also have the ability to send Service Coordinator Notifications (SCNs) to MCOs via fax. Now, beginning Sept. 1, users can also create and submit Prior Authorization forms electronically from within SimpleCFS. To speed the process, the system auto-populates much of the form data from the MESAV and resident profile within SimpleCFS. Once you’ve completed the remaining form fields, the system automatically chooses the appropriate MCO and faxes the Prior Authorization form for you. You can easily attach supporting clinical documentation to the form as well. The Prior Authorization form and all attachments are archived within the system. 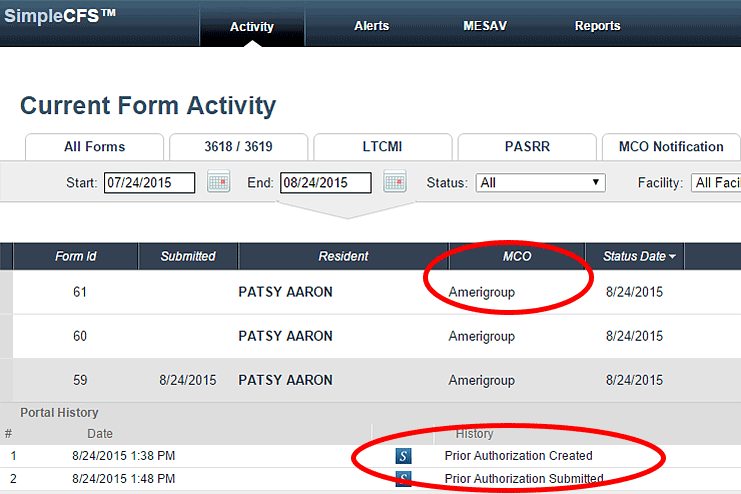 Manage your Prior Authorization forms for all five MCOs in one place. Save time with auto-population of resident/provider data from the MESAV and resident profile. Easily upload/attach supporting clinical documentation to the fax. For SimpleCFS users, this option will become available Sept. 1. Look for a customer webinar to be scheduled soon, which will show the functionality in detail. Texas SNFs that don’t use SimpleCFS can access the standard TDI form and fax to any MCO as needed beginning Sept. 1.